In just weeks, you can learn mindfulness-based stress reduction (MBSR), a clinically proven program for alleviating stress, anxiety, panic, depression, chronic pain, and a wide range of medical conditions. Taught in classes and clinics worldwide, this powerful approach shows you how to focus on the present moment in order to permanently change the way you handle stress. As you work through A Mindfulness-Based Stress Reduction Workbook, you'll learn how to replace stress-promoting habits with mindful ones-a skill that will last a lifetime. "This book, along with the CD giving mindfulness meditation guided sessions, provides an excellent overview of how the practice of mindfulness can be a very effective stress reduction intervention." --G. Alan Marlatt, Ph.D., professor and director of the Addictive Behaviors Research Center at the University of Washington "Bob Stahl and Elisha Goldstein have woven an inspiring tapestry of illuminating insights and practical exercises that can transform your life and even help you build a stronger brain. Inspired by their work as teachers of the research-proven Mindfulness-Based Stress Reduction Program, the authors have provided a step-by-step approach to bringing this scientifically grounded approach into your daily life. Mindfulness has been demonstrated to effectively help us live with less stress, fear, and anxiety and to cultivate more ease, connection, and well-being in our lives. This workbook makes mindfulness understandable and offers a carefully laid-out plan to achieve a healthier and more meaningful life. There is no time like the present to bring these pearls and practices of wisdom into your life. Why not start now?" --Daniel J. Siegel, MD, codirector of the University of California, Los Angeles Mindful Awareness Research Center and author of Mindsight and The Mindful Brain "What a delight it has been too review this beautifully written, deeply important book that offers readers a path toward a new life balance. For those interested in knowing more about what it is that has excited so many in the fields of medicine, psychology, neuroscience, and education, this book is a mind-opening volume that will clarify the key concepts of mindful meditation. Those who simply want to find ways to reduce stress and anxiety will find it to be an extraordinary aid. Those in a program of mindfulness-based stress reduction will find this book an invaluable addition to their training. 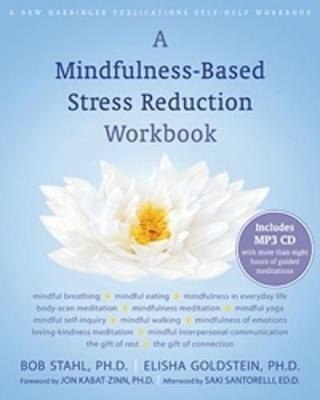 A Mindfulness-Based Stress Reduction Workbook adds depth to the practice of mindfulness for everyone, from beginning practitioners to experienced teachers of mindfulness stress reduction classes." --Marion Solomon, Ph.D., director of training at the Lifespan Learning Institute and author of Love and War in Intimate Relationships "This book is an excellent guide to the life-changing practice of mindfulness. In these pages, you will find the missing piece, the hidden truth, and the open secret. Mindfulness saved my life and transformed my world. This workbook offers the key to health, happiness and freedom. Read it, work it, practice it, and be free." --Noah Levine, MA, author of Dharma Punx and Against the Stream "We are such a stressed society that many of us are stressed about how stressed we are. Books abound that give us more information. But A Mindfulness-Based Stress Reduction Workbook takes a far more helpful approach. It takes you by the hand and leads you step by step. If you want your life to have greater balance and peace, if you want to live with less stress and more joy, I can't recommend this beautiful offering highly enough." --John Robbins, author of Healthy at 100, Diet for a New America, and Reclaiming Our Health "For anyone drawn to a path of mindfulness, this workbook will provide a clear and accessible companion. Authors Bob Stahl and Elisha Goldstein expertly guide readers through a rich assortment of mindfulness practices and reflections, providing invaluable tools for handling stress and living life with presence and heart." --Tara Brach, Ph.D., author of Radical Acceptance "This fine book is about the unburdening of the mind and the release of our inherent wisdom. It breaks the hard sternum of our resistance and opens the lotus of the heart. The method that ends our madness." --Stephen Levine, author of Who Dies?, A Year to Live, and Unattended Sorrow "I found this workbook informative, helpful, and user-friendly. It is filled with pragmatic tools to keep the practitioner on track and would be beneficial to all who read it." --Sharon Salzberg, author of Lovingkindness, A Heart as Wide as the World, and Faith "The biggest challenge for any do-it-yourself course is to include exercises that people will actually want to stop and do. In this book, the exercises are skillfully introduced along with spaces that remind the reader, 'This part is up to you to do now!' I think readers will start practicing immediately with confidence that the program will show results." --Sylvia Boorstein, author of Happiness Is an Inside Job, It's Easier than You Think, and That's Funny, You Don't Look Buddhist "This is an excellent, systematic, helpful, and practical workbook. Doing these practices brings many blessings. They will reduce your stress and truly transform your life." Bob Stahl, Ph.D. founded and directs mindfulness-based stress reduction (MBSR) programs in three medical centers in the San Francisco Bay Area. A longtime mindfulness practitioner, he has completed MBSR teacher certification at University of Massachusetts Medical Center and lived in a Buddhist monastery for more than eight years. Bob also serves as adjunct senior teacher for Oasis, the institute for mindfulness-based professional education at the Center for Mindfulness in Medicine, Health Care, and Society at the University of Massachusetts Medical School.